Nobody who grew up during the fifties, sixties and seventies needs introducing to Ladybird Books. These modestly sized illustrated books were a feature of every classroom, and most children’s bedrooms. Each book followed a similar formate; a page of text opposite a full page illustration. And not just any illustration, but one done by many of the top illustrators of the day. 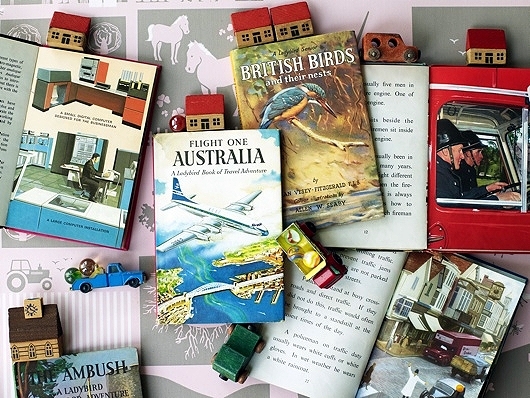 The Ladybird universe covered everything from early reading level titles with just a few words per page, to full blown historical titles aimed at older children. The books were arranged into various series, on natural history, figures from history, technology, etc. Obviously as a kid, these proved almost irresistible and once you had a few, you really wanted to get the matching volumes. The books also tied in with many national school reading programmes, so if you couldn’t save up the half crown cover price, you could often find them in the school library. Some years ago Easy On The Eye did a pioneering site trying to list all the titles and series’ for other collectors. These pages are very very primitive but the information is still pretty useful for newcomers. Do keep in mind that navigation is quite primitive too, so best start at the Listing Index page and then try to find your way around! If we get some time, we might try to bring this material over here one day and tidy it all up. We were very lucky to interview one of the directors some years ago, and chatted for a couple of hours about the firm’s history (it’s on a cassette somewhere) and it would be great to do a history of the range one day. The lovely montage above was taken by Homes & Antiques magazine for a feature on the books. We do have lots of spare Ladybird Books so will put these on the shop at some stage. We also have a great section on the site here devoted to I-Spy books.